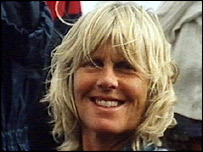 A woman who had a pioneering operation for facial paralysis at a West Sussex hospital has said the surgeon who carried it out was a "miracle man". Vivvy Butler, from Surrey, said she felt normal again and was able to smile after the temporalis tendon transfer at the Queen Victoria Hospital. 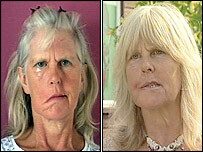 "This operation gave me back my face, which is wonderful," she said. Plastic surgeon Charles Nduka said he hoped the technique would become more widely available across the UK. It involves severing a major facial muscle and related tendon, stretching them across the face and attaching them to mouth muscles. "I went to France and Brazil to learn this technique and it has been a real revelation," said Mr Nduka. A clinic has now been set up at the East Grinstead hospital which brings together maxillofacial and plastic surgeons with a speech therapist, psychotherapist and physiotherapist. "I am very lucky to work in this team - it is very rewarding," said Mr Nduka. Ms Butler, from Elstead, suffered a benign brain tumour six years ago which paralysed her face. One side of my face was paralysed - it drooped right down and I couldn't smile," she said. "I felt very ugly to begin with. I was worried my husband wouldn't love my any more. "It was difficult to communicate and I was worried that I would be scary to kids." She said she tried various treatments, but achieved only minor improvement until she had the operation three months ago, in time for her son's wedding. "I suddenly found out about this miracle man who does this brand new operation and I decided to go for that," she said. "My face has been pulled up so it is more even and I can smile a little and I feel normal again."